Preparing for the Cambridge Exam here in Madrid? This little guide from our teachers will give you a head start to pass with flying colours! It is a good idea to familiarise yourself with the exam format as well as the relevant grammar topics as it will help reduce anxiety and nerves on the day. So lets get started and aprender ingles a domicilo! Can I take this exam? If you are using English in a work or study environment with some confidence, it is useful to have this qualification to show your knowledge! More than 60,000 students sit this exam every year all over the world. It is difficult, and is ADVANCED level. If you haven´t yet experienced the format, we strongly recommend doing the FIRST Certificate exam intially. Not only will this build your confidence and knowledge of the exam format, but it is a better guarentee for success as the exams are quite expensive. Listening – 30 questions divided over 4 parts with 90 minutes in total. This is often the last part of the exam and you may be tired by this point! Speaking – a 15minute interview divided into four parts, some sections with another student. CAE pass is accepted for entry to some universities. The Reading and Use of English section counts for 40% of the marks. The Writing, Listening & Speaking sections each count for 20% of the marks. You will receive a Statement of Results. If your performance ranges between CEFR Levels B2 and C2, you will also receive a certificate. If you do not pass, but still do quite well you are issued a B2 certificate. You can do the CAE exam on a computer or on paper. We can help you book the test here at our academy in La Elipa or in La Almudena. Simply give us a call or tell the office manager at your convenience and our native teachers would be delighted to discuss the exam with you. It can be taken throughout the year and costs approximately 190-200 euros to sit. Am I ready to take the test? Can you answer these Reading and Use of English questions from examenglish.com with ease? 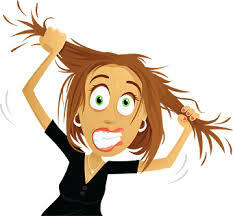 Or do you need to book one of our exam preparation classes to feel more confident? Contact La Elipa or La Almudena on 910 01 42 81 today for advice, information and help para Preparar el examen del Advanced de Cambridge. 1. Brian was really interested in North American history in his school days. Brian North American history in his school days. 2. When it comes to population, Beijing’s is much bigger than Auckland’s. 3. The manager should think about experience when hiring new staff. The manager should when hiring new staff. This entry was posted in CAE/FCE, Exam and tagged CAE, Cambridge, Exam, exam tips, preparation, Study, work on April 5, 2018 by Luisa. Here at The Language Corner in La ELipa and García Noblejas we have been getting many requests for information about Aptis, the latest exam by The British Council. In both our English academies we offer preparation classes for both Aptis General and Aptis Advanced. But before you sign up to English classes in our academy, let’s explain exactly what the Aptis entails. Firstly, it’s worth noting that the entire Aptis exam is done on a computer. It takes a total of 2hours and 32 minutes with all the skills being tested. It’s a scaled exam so there is no pass or fail mark but your results are given as a CEFR level for A0-C for the Aptis General and B1-C2 for the Aptis Advanced. The Aptis, as well as being a cheaper and quicker alternative to the Cambridge exams such as The First Certificate and Advanced it is also becoming more widely recognised here in Spain. The Aptis General is valid if you are a student and need to demonstrate you have a B1 or B2 level and the Aptis Advanced is accepted by the Comunidad de Madrid as proof of linguistic competence for teachers. As with most English language exams, Aptis is split into sections covering Reading, Writing, Speaking Listening and Grammar & Vocabulary. Let’s have a look at each section and how to best approach it. The first part of the Speaking consists of 3 simple questions which you have 30 seconds to respond to. They are usually related to your life, your hobbies, family or holidays. Each question will usually require you to use a certain tense so be mindful of that when you are answering. As the test is done on a computer, a good way to practise this particular part is to record yourself answering some basic questions on your phone while using a timer. This will not only help you with time management but also with your pronunciation and intonation. Being the first part of the test means the questions are simple but it doesn’t mean your answers have to be. I don’t mean that you should try to over-complicate things but it is a good idea to use these short questions to show off some vocabulary you know related to the topic. An example could be to learn an idiom that describes a person such as “He/she is a blast!” (the person is a lot of fun) This way you can use it to describe a friend, family member or someone you work with. Please tell me about your family. Each answer should be between 4 and 6 sentences long. Speak clearly and at a pace you’re comfortable with and you should have no problem answering the questions from part 1. In the second part of the Speaking Test, you will be asked to describe a picture and then answer two further questions about it. This time you have 45 seconds to respond. A typical example of this could be the picture on the left. Do you often have to work in a team in work or university? 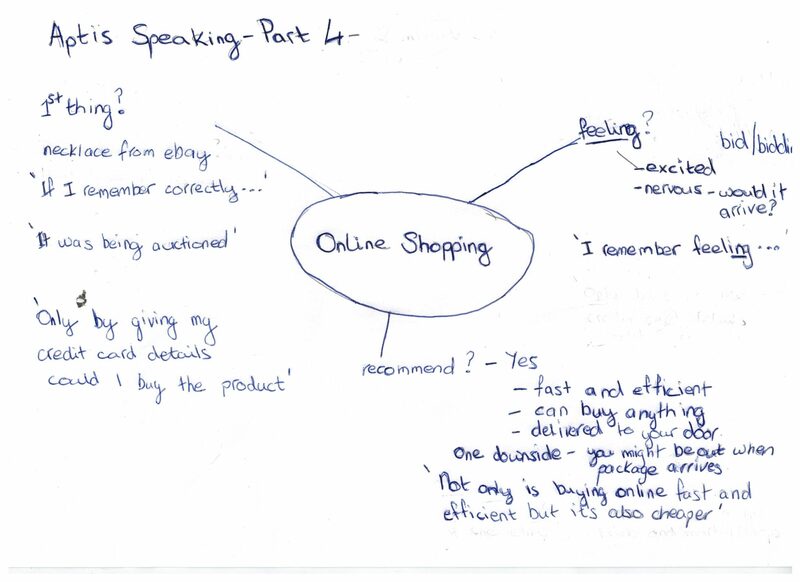 To see example answers to these questions and tips on how to describe pictures, check out our previous entry on Aptis Speaking. In this part of the exam, you will be shown two pictures and asked to compare them. This is quite similar to the FCE or CAE and finding examples from those exams will help immensely. Again, there are 3 questions which each have a 45 second limit for answering. Why might people choose each type of holiday? Which of these types of holidays are better for you? The last part of the Speaking test for Aptis, you are once again given a photo with three questions. This time, however, you’ll have one minute to prepare your ideas and two minutes to cover all three questions. 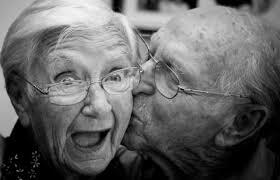 Describe an old person you admire and why. What characteristics do they have that you like? Don’t forget you can prepare for the Aptis exam in Madrid in our English academies in Madrid in both La Elipa and Garcia Noblejas. All of our native teachers at our language academies are familiar with not only the Aptis but also all of the Cambridge exams. So if you are looking to prepare for the FCE in Madrid or the CAE in Madrid, make sure you stop by our English academies in Madrid in La Elipa and La Almudena. Looking forward to meeting you! This entry was posted in Academia de inglés en Madrid, Aptis, British Council, CAE/FCE, English in Madrid, Exam, Our Teachers, Uncategorized on March 28, 2018 by Merlin. 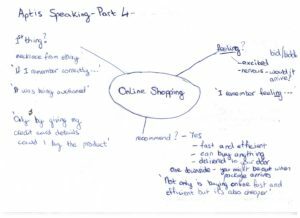 Today at The language corner we’re going to look at the second part of the Aptis Speaking test, with tips and sample answers to give you an idea of what is needed in this relatively new exam by The British Council. Of course, here in our English academies, you can prepare for the Aptis as well as The Cambridge exams with our native teachers. 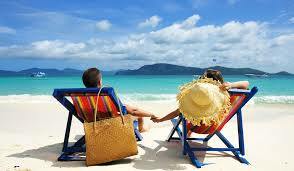 In the first picture on the left, a couple can be seen relaxing in deck chairs at the beach. I imagine they are a couple as they are holding hands and the woman seems to be gazing at her partner. There is a bag hanging off one deckchair and a hat hanging off the other. It looks idyllic if I’m honest. In the second picture, we can see a group, with backpacks on hiking through the mountains. They appear to be following a trail and are properly prepared for the terrain. It reminds me of going trekking with my friends in the mountains outside my city. I reckon people choose beach holidays to get away from the hustle bustle of the city and to completely switch off. Not only do they get to relax on what seems like a paradise island but they also don’t have to worry about the stresses of their daily life. On the other hand, this type of trip can seem utterly boring to some people which is why they might prefer to do something more active. They also want to escape the fast-paced way of things in the city by getting fresh air in a pristine landscape but obviously lying on the beach for days would just bore them to tears. Both types of holiday have their benefits. Relaxing on a beautiful beach for a week might do somebody who has a high-stress job or day to day life the world of good as they can just switch off and forget about everything for the time being. 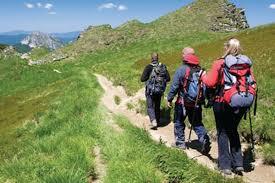 However, the hiking holiday is obviously more active and in that way, it’s physically better for you. I suppose it all depends on whether you want to do something active or would benefit just as much from simply taking a break from your daily routine. Tell me about the first thing you bought online. How did you feel about the purchasing? Would you recommend online shopping? For this question, since you have a minute to prepare it’s a good idea to jot down the points you want to mention without writing full sentences. Be careful not to describe the photo given as this is not the task in this question. The questions are more abstract (e.g a feeling). Make sure you answer all three questions and stay on topic. Doing otherwise will lose you valuable points. You are free to glance at your notes while you speak so it’s really important to practise brainstorming and making the most of this. Here is an example of how you can brainstorm some ideas in one minute. Notice that as well as answering the questions I’ve also included short structures to include in my answer. This final part of the Aptis speaking exam is aimed at the higher levels so it’s important to incorporate advanced structures into your answer. Think about inversions (not only but also, only if/when), passives, conditionals etc. It’s also good to use any related vocabulary you can think of. Having said that, we also recommend you stick to what you know in the exam. Practise these structures before the exam so you are confident using them. Don’t try to wing it in the exam by throwing in structures you half know and are likely to get wrong. 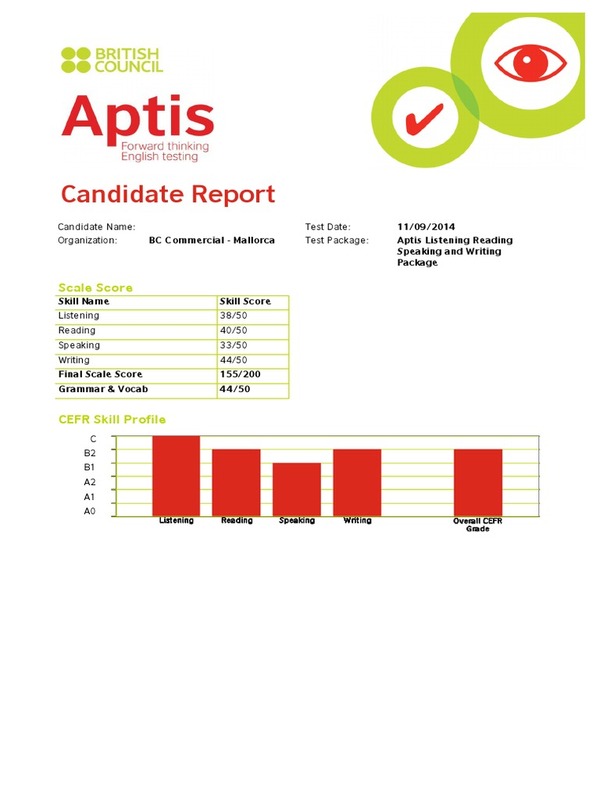 Accuracy is of vital importance in any speaking exam and the Aptis is no different. If I recall correctly, the first thing I bought online was a necklace from eBay. It was being auctioned on the site and I thought it was really beautiful. I remember feeling excited by the bidding process. I would place a bid and wait to see if someone outbid me for the item. In the end, mine was the highest bid and I won the auction. I also remember feeling quite nervous however because of the payment method. Only by giving the website my credit card details could I proceed. I was also worried it wouldn’t arrive even after paying for it. I decided I’d have to take the chance and thankfully my necklace arrived shortly after. I would definitely recommend shopping online nowadays. There are so many shops and you can buy virtually anything delivered to your doorstep. It’s really handy for people who work a lot or simply don’t enjoy going shopping on the high street, especially around the holidays or sales when bricks and mortar shops are packed. Not only is shopping online faster and more efficient but it’s also cheaper than the high street stores a lot of the time. As you can see, I used the notes from the spider diagram to shape my answer but also added more information as I thought of it. I hope this helps. Don’t forget you can prepare for the Aptis exam in Madrid in our English academies in Madrid in both La Elipa and Garcia Noblejas. All of our native teachers at our language academies are familiar with not only the Aptis but also all of the Cambridge exams. So if you are looking to prepare for the FCE in Madrid or the CAE in Madrid, make sure you stop by our English academies in Madrid in La Elipa and La Almudena. Looking forward to meeting you! This entry was posted in Academia de inglés en Madrid, Aptis, British Council, CAE/FCE, English in Madrid, English tips, Exam, Idiomas Madrid, Our Teachers, profesor nativo inglés Madrid, Speaking, Uncategorized on March 28, 2018 by Merlin. 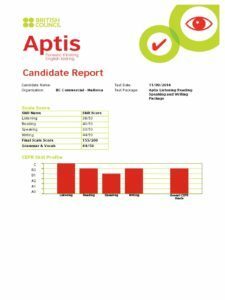 The Aptis by British Council is a relatively new exam but it is quickly gaining popularity among English language learners. This is due to it becoming more widely accepted both here in Spain and around the world, it being cheaper than other exams like Cambridge, and being able to get the results more quickly. Knowing exactly what an exam entails is half the battle when preparing for it. Today we’re going to look at the Speaking exam. The entire exam is done on a computer, so for the speaking part, you have to record your answers within a given time limit. This means preparation is key. Knowing what to expect and being ready to show off your language skills will help achieve your goal. In the first part, you have to answer questions about yourself. There are three questions and you must talk for thirty seconds for each question. Possible topics you could talk about include Family, Your Job, Hobbies and Interests, Future Plans, Films and Books, The Weather, Daily Routine etc. This means four or five clear sentences. If for example you are asked, “What’s the weather like today?” You might think it impossible to have your answer last a full thirty seconds. This is why it’s important to brainstorm things related to the weather. What do you like to do when it’s hot outside? What clothes are you wearing for the current season? Is it typical weather for this time of year? Is it unusually hot or cold? So a typical answer to “What’s the weather like today?” doesn’t have to be difficult to elaborate on. Instead of just replying “It’s cold but sunny” you can add “but this is normal for Madrid in winter. People usually wear hats, scarves, winter coats and boots to stay warm. A typical winter snack is roasted chestnuts which you can buy from street vendors.” Instead of talking solely about the weather, we can incorporate other related vocabulary like in this instance; clothes. But we could also talk about what people generally do in when the weather is hot/cold etc. The questions in part one of the Aptis lend themselves to elaboration. You should keep talking, adding relevant sentences until your time is up. In the second part of the Aptis speaking exam, you are given a picture which you have forty-five seconds to describe. You then have to answer to related questions with a limit of forty-five seconds for each. Describing a photo is a question that comes up in many exams. With this type of question, you should take as much time as possible to gather your thoughts. Then use all of the time given to talk about it. 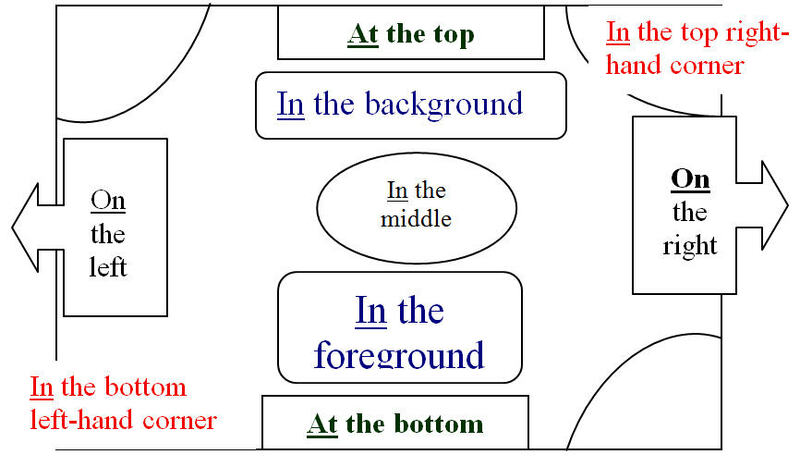 Below are some useful phrases to describe the position of things within a picture. Let’s try to answer the questions above. Remember you have 45 seconds for each answer which should be approximately 5 to 7 clear sentences. In this photo, I can see a group of people sitting around a table. In the background, there is a large window and the room is bright. There are posters on the wall behind them. They seem to be working on something together. In the middle of the table, there is a model of something which they are pointing to and discussing. Maybe it’s a building. They might be doing a project together for a university class. Maybe they are engineering students and they are doing a project on town planning. When I was at university, I often had to give presentations with other students. We would be given a project to discuss and research and would have to present it together in front of the rest of our class. I enjoyed working with my classmates on these projects as it gave me a different perspective on the topic. However, I also got very nervous having to speak in front of so many people. I used to practise as much as I could beforehand to feel more relaxed about it. Teamwork is very important, not only in university but also in the working world. As I mentioned before, having more than one person working on a project allows for more input and different points of view to be considered. Being able to work in a team is beneficial as it reduces the workload for everyone involved and means projects can be finished more efficiently. As you can see, each answer has clear, concise sentences. I hope this helps you in your preparation for Aptis or indeed any English exam in which you are asked to describe a picture. In the next part of this series, we will look at parts 3 and 4 of the Aptis speaking exam. Don’t forget to check back soon. In our English academies in La Elipa and Garcia Noblejas, you can prepare for Aptis as well as the Cambridge First Certificate and Advanced. This entry was posted in Academia de inglés en Madrid, Aptis, British Council, English in Madrid, English tips, Exam, profesor nativo inglés Madrid, School Information, Speaking, Uncategorized on February 6, 2018 by Luisa. Which is more difficult – English or Spanish? Phil on The Arrival of Spring… Almost! Me Ben on The Arrival of Spring… Almost!